Equal mix of Bacopa monnieri + Centella asiatica whole herbs in powder form. Brahmi, regarded as ‘the giver of supreme wisdom’, is one of the most powerful nervine and rejuvenative herbs in the ayurvedic material medica. Brahmi, however, is the common name of two different herbs. One bears the Latin name Bacopa Monnieri, and the other, Centella Asiatica or commonly Gotu Kola. While both are independently regarded for the nerve soothing and rejuvenative properties, each has a distinct set of effects that renders them individually useful for slightly diverse applications. Bacopa Monnieri is known for its very bitter taste very powerful cleansing properties. It is generally used to increase intelligence and longevity, and to treat anxiety, depression, Alzheimer’s, and epilepsy. Gotu Kola, however, though sweeter in taste is similarly used to support mind function, memory, longevity, and aid against their degeneration, but it further has blood purifying properties which render it effective against a number of skin conditions, and certain types of fevers. These two plants having similar effects and a common name are often confused. To avoid this confusion, they will here be referred to by their alternate names. Perhaps a look into their various methods and indications of application will further help to distinguish them. Brahmi is ground leaves from the bacopa plant. It is used both internally and externally. Externally, it can be applied as a paste or in oil to relieve the pain and swelling of the joints due to injury or arthritis. Internally, it is one of the best tonics for the nerves and is widely used in Ayurvedic treatments epilepsy and hysteria. Due to its inherent strength it can be very toxic at high doses, and so is generally steeped in water as with tea as opposed to a decoction in which the herb is boiled in water for some time. This mild infusion can be very bitter and it is recommended to be taken with honey. In this form, bacopa delivers all the effects for which it is famous. It improves the memory and intelligence, soothes the nerves, relieves headaches, cools the body, relieving burning and pain, and is even slightly diuretic, helping to cleanse the kidneys and blood of toxins and excess salts. Gotu Kola is the ground leaves from the gotu kola plant. It is also used both internally and externally, but has slightly different effects. Gotu kola is a tonic and rejuvenative for Pitta, and used externally it helps to relieve burning and itching in chronic skin conditions. Internally, its blood purifying effect helps to alleviate a wide range of skin conditions from the very serious like leprosy and syphilis to the less serious like eczema and psoriasis. For such conditions, combined internal and external application can augment these effects. Gotu kola taken in a mild infusion or as a tea is also soothing to the nerves, supportive of cognitive function, and an aid against aging and memory loss. It further supports the immune system and the adrenal glands by both feeding and cleansing them. Taken in as a decoction in milk it is especially soothing to the nerves, and can be a great tonic for anxiety, nervousness, and headache. 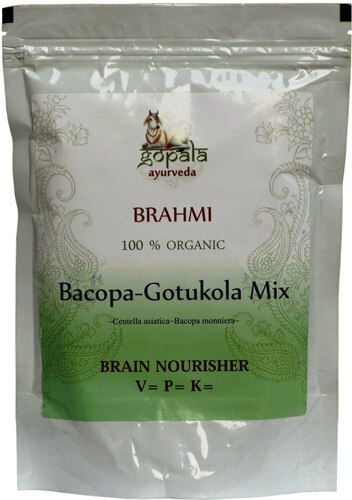 Gopala Brahmi Powder is a potent combination of bacopa or gotu kola. This combination is the choicest for relieving stress in pitta, kapha, and vata imbalances. This combination of herbs is tridoshic, and hence useful for all constitutions. This blend of herbs is consequently very effective for relieving stress and nerve related pain, enhancing intelligence, memory, mental stability, and tranquility. It gives symptomatic relief for related conditions, but is also effective against chronic conditions. It helps one adapt more easily to change and hence relieves mental fatigue. Ayurvedic scriptures state that it is an important revitalizer of the spirit, and should be in every home. Brahmi is the herb of the mind, yogis of the Himalaya have been using it as food for meditation for hundreds of years, and continue to do so to this day. Brahmi is both bacopa and gotu kola, and these two share many properties and bear certain differences. Each has been used in distinct concoctions and for distinct purposes. However, as these similarities and differences can be used to complement each other the two are often used in combination. Both are powerful herbs that have played a central role in ayurvedic herbology for many centuries, and no doubt will continue to be. Contents: 250g Powder packed into a food grade, light proof, Zip lock pouch. Rejuvenates & nurtures the nervous system. ♥ Certified as Organic by “Control Union Netherland”.